Available in 3-6, 6-12 & 12-18 Months. 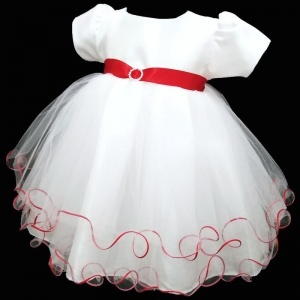 Baby girls white & red sash diamante tulle dress, perfect for a baby flower girl or special occasion. Dress: This dress has a fully lined white dupion bodice. Featuring a stunning ring of diamantes on the centre of a red satin sash which beautifully ties around the back into a large bow. This dress has short puff sleeves with a discreet zip fastening at the back. Two layers of fluttered net tulle with red piped edging complete with underlay. This designer dress is made in England and designed by UK designer 'Eva Rose'. The quality is outstanding and is made with the finest materials. Brand new complete with tags, hanger and a clear protective bag to keep the dress in perfect condition. For all pre-order items we dispatch every Tuesday & Friday morning (actual dispatch date will be shown on the product page).